As the old saying goes, “If you don’t use it, you lose it.” And over the summer, kids from every grade level stop actively learning, losing a good bit of what they’ve absorbed during the school year. It’s called “summer slide,” “brain drain,” or “summer learning loss,” and it occurs when students “turn off their brains” during the summer months. And in case you missed our previous post on how to prevent summer learning loss, consider this post the prequel. It might even look like a horror movie, as the statistics can be pretty frightening. The good news is, parents who understand what summer slide is and address it early on - as in, during elementary school years - have found that students perform better in the long run—developing outstanding learning habits that carry through on to high school and college. Here are 12 facts you should know about summer slide. How much could possibly be lost in a summer? 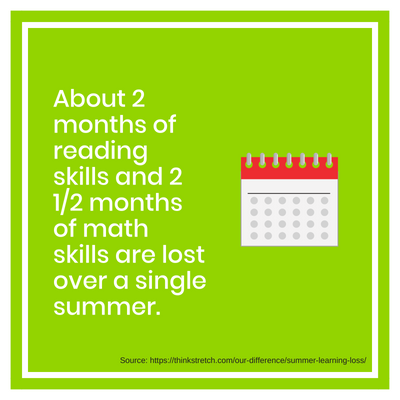 Research indicates 2 months of reading skills and 2 1/2 months of math skills are lost over a single summer. Plus, summer slide is cumulative, so those lost months add up over time. Combined over the years, by the time a student reaches middle school, they’ve lost the equivalent of 2 years of learning to summer slide. And the loss is greater at higher grade levels. 9 out of 10 teachers have to re-teach material when kids return to school in the fall in order to get students caught up. Teachers spend anywhere from 4-6 weeks re-teaching material students forgot due to summer slide. While schools may stop teaching in the summer, the learning doesn’t have to come to a halt. Students who read or engaged in another form of learning just 2-3 hours per week during the summer prevented summer slide. Having direct access to books can significantly help students reduce brain drain, beat summer slide, and retain information from the school year. It’s a fact—reading can be fun. Kids just sometimes need a little kick starter. Take books with you on summer trips and vacations. With nowhere else to turn, books can be a welcome source of entertainment. Take kids to the library regularly. Over time, trips to the library can turn into anticipated activities, allowing kids to look forward to their next book selection. Join a book club or other book subscription service and let kids choose their books. 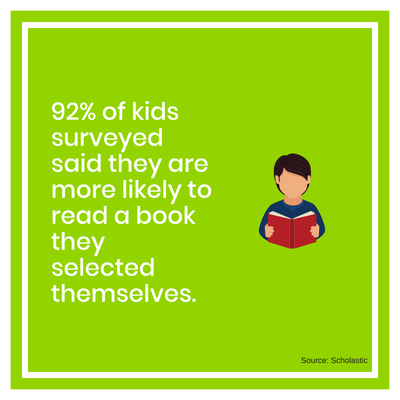 Speaking of selection per the point above, 92% of kids surveyed said they are more likely to read a book they selected themselves. Introduce a child to a popular book series (like Harry Potter). Doing so gets them engaged and wanting to keep turning pages, and encourages them to revisit books more often. 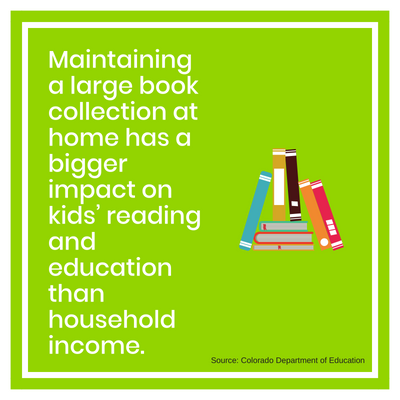 Not only is it great to have parents at home who can read to kids and model good reading behavior and habits, but maintaining a large book collection at home has a bigger impact on kids’ reading and education than household income. In fact, low income households with access to books over the summer see better and more significant improvement in reading scores from spring to fall than students from high-income households, who also have access to books. Children who read four or more books over a summer perform better on reading-comprehension tests in the fall than their peers who don’t—regardless of household income level. 3rd graders who can’t read at their grade level are FOUR TIMES less likely to graduate by age 18 versus a proficient 3rd grade reader. At home during the summer, make sure to pick materials within your child’s age range or slightly above. Kids will read up, but never read down. 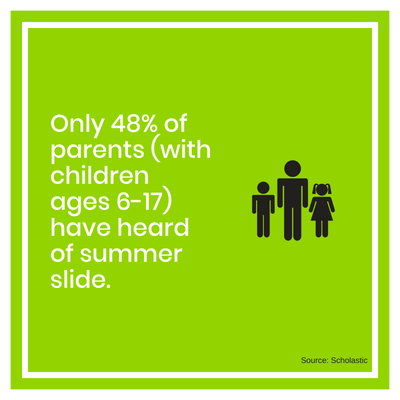 Only 48% of parents (with children ages 6-17) have heard of summer slide, while just 38% of lower-income parents have heard of it. Only 9.2% of students attend a summer learning programming to combat summer slide. One month of learning is effectively lost to the summer. Summer slide or learning loss can be recognized as early as grade one. According to estimates, it costs the educational system more than $1,500 per student to reteach materials. Over the course of a K-12 education, that can equate to more than $18,000 per student. In reality, combating summer slide isn’t as hard as you think. Experts suggest the best way is just to keep your kids active and up off the couch. Find fun activities that keep their minds engaged. This will encourage them to return to the activity and repeat it. Students do get overwhelmed, though—the key is keeping them from completely checking out. Summer camps like iD Tech not only keep kids active but challenge them and get them thinking about the bigger picture; i.e. what are they going to do after high school and college. If you have a child who loves computers, they may also be interested in building their own. A video game player may also dream of becoming a game designer or programmer. Or maybe a child spending a lot of time with their phone and apps would be interested in developing a mobile game. Get your kids active and thinking this summer—that’s the best way to beat summer slide.